Memory & Justice: Who are the Shepherd's Heart and what do they believe? Who are the Shepherd's Heart and what do they believe? 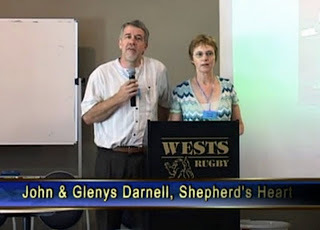 John Darnell and his wife Glenys run a church in Canberra called the Shepherd's Heart. Formerly it was called The Fold Christian Fellowship. Because I have no aversion to calling things by their right name, I say they are dangerous lunatics. I know this because they provided a treatment program to my beloved wife which has contributed to the ruination of her life. I am writing, obviously, to warn others. The Darnells believe they have a special calling. For years, they have received people (disproportionately, women) whose initial presentation may only be of emotional distress. Some may have diagnosed or undiagnosed mental illnesses. They believe that their calling is to assist their subjects recall, acknowledge and then heal from trauma, even abuse, experienced earlier in life. Critically, the subject may be entirely unaware they had endured this abuse and trauma until the Darnell's techniques produce distressing recollections that then have to be interpreted and processed. The problem is that these recollections are false. The implications are devastating, both for the subjects of such counselling and for their families. There is also an uncomfortable implication for those poor souls who may actually have endured some form of abuse in their past, and for whom this style of counselling muddies the waters no-end. This is a well known phenomenon called False Memory Syndrome. It is otherwise known as Repressed Memory Therapy (RMT). It has been widely reported, even in the Australian media, and the archetype case, that of a woman named "Sybil", has been comprehensively discredited and debunked.